THE EAGLE HAS LANDED —–what a comedown for John Sturges, director of The Great Escape, and what a travesty of a great bestselling thriller classic from Jack Higgins. Sturges bailed on the editing process to go deep-sea fishing (he told star Michael Caine that financing that hobby was why he was making the movie), the tone wobbles, the tension from the book is AWOL. 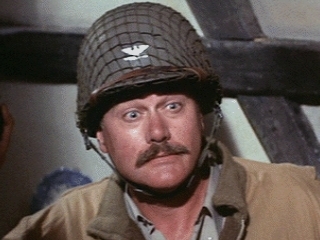 Higgins’ clever idea has an elite German parachute unit attempting to kidnap Winston Churchill, with some assistance from the I.R.A., but screenwriter Tom Mankiewicz (guilty of Live And Let Die, Diamonds Are Forever, The Cassandra Crossing and Superman 2: I rest my case) makes a hash of most of it. Fine cast but they clash rather than cohere. Caine makes a good leader. 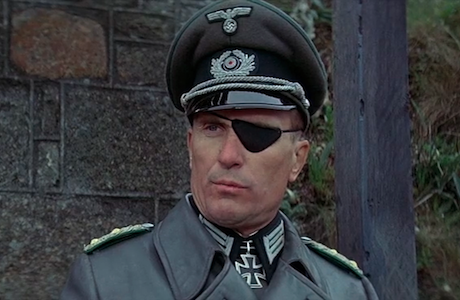 Robert Duvall is so-so as Caine’s duty-bound superior–you just keep thinking “hey, that’s Duvall with an eyepatch and a German accent”. Donald Sutherland blows his Irish accent as the I.R.A. contact (though not quite as badly as he mangled one in The Great Train Robbery ). Donald Pleasence makes the most of a five-minute cameo as Heinrich Himmler—by far the best thing in the film. Treat Williams, Jenny Agutter and Anthony Quayle are wasted, just marking time, and Larry Hagman is atrociously over-the-top as a gung-ho American colonel—it bazookas a gaping hole in the second part of the 123 minutes (134 /145 in some prints). Lalo Schifrin’s score is all right, action scenes are not exciting. Costing $6,000,000, it made around $9,000,000 in 1977 and seems to have a fair number of fans, which makes me think most of them must not have read the book. Sturges’ last film, with Siegfried Rauch, Judy Geeson, Jeff Conaway. Stick with the book: there’s a reason it sold 50,000,000 copies.